To mimic this architectural complexity in their engineered tissues, the researchers embedded a mixture of brain cells taken from the primary cortex of rats into sheets of hydrogel. They also included components of the extracellular matrix, which provides structural support and helps regulate cell behavior. Those sheets were then stacked in layers, which can be sealed together using light to crosslink hydrogels. 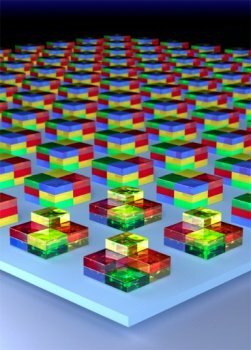 By covering layers of gels with plastic photomasks of varying shapes, the researchers could control how much of the gel was exposed to light, thus controlling the 3-D shape of the multilayer tissue construct. This type of photolithography is also used to build integrated circuits onto semiconductors — a process that requires a photomask aligner machine, which costs tens of thousands of dollars. However, the team developed a much less expensive way to assemble tissues using masks made from sheets of plastic, similar to overhead transparencies, held in place with alignment pins. The tissue cubes can be made with a precision of 10 microns, comparable to the size of a single cell body. At the other end of the spectrum, the researchers are aiming to create a cubic millimeter of brain tissue with 100,000 cells and 900 million connections. The new system is the first that includes all of the necessary features for building useful 3-D tissues: It is inexpensive, precise, and allows complex patterns to be generated, says Metin Sitti, a professor of mechanical engineering at Carnegie Mellon University. “Many people could easily use this method for creating heterogeneous, complex gel structures,” says Sitti, who was not part of the research team. Because the tissues include a diverse repertoire of brain cells, occurring in the same ratios as they do in natural brain tissue, they could be used to study how neurons form the connections that allow them to communicate with each other. “In the short term, there's a lot of fundamental questions you can answer about how cells interact with each other and respond to environmental cues,” Boyden says. In the long term, the researchers hope to gain a better understanding of how to design tissue implants that could be used to replace damaged tissue in patients. Much research has been done in this area, but it has been difficult to figure out whether the new tissues are correctly wiring up with existing tissue and exchanging the right kinds of information. Another long-term goal is using the tissues for personalized medicine. One day, doctors may be able to take cells from a patient with a neurological disorder and transform them into induced pluripotent stem cells, then induce these constructs to grow into neurons in a lab dish. By exposing these tissues to many possible drugs, “you might be able to figure out if a drug would benefit that person without having to spend years giving them lots of different drugs,” Boyden says. Other authors of the paper are Yantao Fan, a visiting graduate student at HMS and HST; Feng Xu and Emel Sokullu Urkac, postdocs at HMS and HST; Gunes Parlakgul, a visiting medical student at HMS and HST; MIT graduate students Jacob Bernstein and Burcu Erkmen; and Wangli Xing, a professor at Tsinghua University. The research was funded by the National Science Foundation, the Paul Allen Family Foundation, the New York Stem Cell Foundation, the National Institutes of Health, the Institute of Engineering and Technology A.F. Harvey Prize, and MIT Lincoln Laboratory.